Defeat a leader of the Veiled Heritance on the high seas. 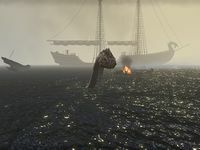 Seaside Sanctuary is back in the control of the Aldmeri Dominion, but Vicereeve Pelidil has escaped aboard a Maormer vessel. Defeat the Maormer boarders on deck. Defeat the sea serpent with the ballistae. Travel to the Maormer ship, and defeat the enemies on board. Talk to Captain Jimila on the Prowler. Talk to Captain Jimila in the harbor. Talk to Captain Jimila when you are ready to go after Vicereeve Pelidil. This will cause the Prowler to set sail, and you wake up in the lower decks. The Maormer are attempting to board the ship. You need to fight them off while avoiding fire from the enemy ship's cannonballs. A sea serpent will approach the ship after you defeat the Sea Vipers. You need to shoot it with the ballistae on the deck four times. The serpent appears at the northeast ballista, the northwest ballista, the southeast ballista (where it may dodge your attack the first time), then alternate between the southwest and southeast. You should note there is no ballista in the southwestern area. Once the serpent is defeated, you will have to repel more Maormer boarders. Two portals appear on deck at this time. After all the boarders have been defeated, you need to enter the portal at the north end of the deck to kill Vicereeve Pelidil. Use the portal to return to the Prowler. Talk to Captain Jimila, and tell her to sail back. Talk to Captain Jimila again once you are back for a reward. This page was last modified on 6 December 2017, at 16:07.